In October/November 2012 I visited the Himalayas. I spent eleven days in Nepal and four days in Bhutan. The whole trip was organized by Himalaya Holiday Service. I was very happy with the tour itinerary and the tour organization. The local tour organizer in Bhutan was Keys to Bhutan. I was very happy with their organization as well, everything worked great. My guide, Yadop Kumar Kafley was great, very knowledgeable and friendly. To get to Bhutan, I flew from Kathmandu in Nepal to Paro in Bhutan. On the flight we flew fairly close by Mount Everest and had a good look at the highest mountain in the world. After arriving in Paro, my guide Yadop and driver picked me up at the airport. They were both with me for the entire tour. From the airport at Paro we drove to Thimphu, the capital of Bhutan, where I stayed for 3 nights. On the first full day we visited places around Thimphu, including the market, the huge Buddha statue, a monastery, a temple, and the mini zoo with the Takin, the national animal of Bhutan. On the second day we drove over the Dochula pass to Chimi Lhakhang, the Temple of Fertility. From there we drove to the Punakha. This was the capital of Bhutan till 1955. The Punakha Dzong is an impressive palace/fortress. By chance the king of Bhutan was visiting that palace, so we got a glimpse of the royal couple of Bhutan. In the afternoon we drove back to Thimphu. On the third day I visited the Takstang (Tiger's Lair) monastery. Every report about Bhutan shows pictures of this monastery that is built into a 900 m (2,950 ft) high vertical cliff. It was spectacular to visit. You can drive to within about 1 km (0.6 miles) of the cliff at an altitude of about 2,600 m (8,530 ft), from there you are on foot or horseback. The monastery is at about 3,140 m (10,300 ft). It is a quite strenuous climb. Fortunately, they have horses for hire for $20. It was well worth it. My guide was leading the horse up the mountain. I was on the horse for about 1 ½ hours, and then walked for another ½ hour to the monastery. The total time for the way down was 2 hours, including ½ hour for lunch halfway down. The last night I spent in Paro, near the airport. The return flight was the next morning, back to Bangkok. Paro is the only commercial airport in Bhutan. The flight into this airport is quite exciting if you are a pilot. The airport is deep in a narrow valley, surrounded by high mountains. The altitude at Paro airport (VQPR) is 2,235 m (7,333 ft). The length of the runway is only 1,981 m (6,499 ft), one of the very few airports in the world where the elevation is higher than the runway is long. This makes for a difficult situation during landing and takeoff. The approach into Paro starts somewhere over the airport. You fly away from the airport, descending into the valley. During the descent you clear a couple of mountain ridges by only 2,000 ft (600 m) or so. Once deep in the valley you make a 180° turn back towards the airport. This turn is well below the mountains and takes the plane from close to the mountains on one side of the valley all the way to the other side, almost scraping the valley walls. You then zigzag down the valley towards the airport. The last turn is at only about 150 m (490 ft) above the airport, close to the runway. On takeoff in the opposite direction you head right at the mountain. You need to turn sharply very soon after takeoff at 150 m (490 ft) to avoid the mountain. My flight out of Bhutan was to Bangkok. In order to be able to take off at this altitude from this short runway, they load only the minimum fuel necessary for a ½ hour flight into India, where the plane was fueled for the remainder of the flight to Bangkok. Only Druk Air, the Bhutanese airline, flies into Paro. There are apparently only 8 pilots licensed to fly into this airport. Bhutan (Druk Yul in the local language) is a very small country with only about 700,000 people living there. About 200,000 people live in Thimphu alone, the rest of the country is sparsely populated. 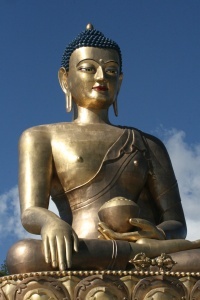 Bhutan is a very religious country, with Buddhism the main religion. About 20% of the people are Hindu. People seem to visit temples a lot and pray. During a visit to a temple or chorten (the Bhutan name for a stupa), they walk around the temple clockwise, while praying, turning small prayer wheels. There are always lots of prayer drums around the temples, and people walk by, turning the prayer drums. There is a sizable number of people who are descendants of immigrants from Nepal and India, many of these are Hindu. A lot of manual labor is done by guest workers from India. Bhutan is a mountain country, it is entirely in the Himalayas. 70% of the area are forest. Paro is at about 2,000 m (6,600 ft) altitude, Thimphu is at 2,400 m (7,870 ft). Monasteries and temples are ubiquitous. I visited several of them and there were always people that prayed in the temples. Rotating the many prayer drums is always part of the visit to a temple. My guide briefly prayed in every one of the temples that we visited. Because of the small size of the country, it would be very vulnerable to loose the identity and traditions of the people through a large influx of tourists. When the country opened up for tourism in the 80's, they decided to limit the number of tourists to prevent them from overwhelming the country. They make it very expensive to visit by charging $250 per day for a visiting permit. I think that limiting the tourist influx is a very smart decision. Because of this, tourists were indeed not overwhelming throughout my visit. They were around, but not intrusive like in some other countries. Bhutan is a constitutional monarchy. It was united as a country in the late 19th century. In 1907, the first hereditary king of Bhutan was chosen. In 2008, the country became a democracy. The current king is the 5th king of Bhutan. It seems to be a very stable country, although my guide told me that they currently seem to have a government crisis without a decisive ruling majority. This seems to affect their capability to spend money on needed repairs. Bhutan has by now electricity everywhere in the country. Apparently this was just recently completed. Electricity is all hydroelectric. People were generally very friendly. Many were interested in hearing about other countries. Many people in Bhutan wear traditional clothes. For women, this is an ankle length dress, for men it is a knee length dress. School children generally wear a school uniform in the same style. The food in Bhutan was pretty good. We had either buffet style food or ordered several local dishes. That provided a nice variety of different dishes. What I liked very much was the fact that there were always one or two VERY spicy dishes. The people in Bhutan like very spicy food, chili peppers are everywhere. This was great for me since I like hot food. The beer is regular German style lager, just what I like. It is relatively inexpensive with $3.50 to $4.50 for a 0.6 liter (1.3 pints) bottle. The hotel in Thimphu was very good, with very good, attentive service and good food. Only in the hotel in Paro was the food mediocre. The breakfast in that hotel was really bad, very poor selection, not even orange juice. I ended up eating just a couple of bananas. Bhutan has left-hand traffic (like India and Nepal). Traffic is usually very light. The roads around Thimphu are good. Only on the way to Punakha did we encounter bad road conditions. But there was construction on that road to widen and improve the road. People in Bhutan have a strange habit of driving in the middle of the road or even on the right side of the road. This made for interesting situations with oncoming traffic when neither driver really wants to move away from the center of the road. My driver habitually drove on the right side of the road, I don't really know why. On the way to Thimphu I thought that he wanted to stay on the mountain side of the road, but he did the same thing on roads on the other side of the mountain. Most cars in Bhutan are fairly new, none of the old beat-up wrecks that you see so often in developing countries, for instance in Africa. There are quite a few trucks on the roads, but they were never much of a problem. They did let us pass without any problems. People's houses, palaces, temples and monasteries all have very similar styles. Houses are usually decorated with painted wood trims. Buddhist chorten (stupas) are everywhere. One interesting type of religious building is built on mountain streams. The little buildings contain a large prayer drum that is driven by the water of the little stream. The drum rings a bell at every rotation, so you hear this constant ding ... ding ... ding echoing through the woods. One of the most impressive pieces of architecture is the huge Buddha statue on the mountain over Thimphu. It is 51.5 m (169.0 ft) high, made of bronze and gilded. It is supposedly the highest statue of a sitting Buddha. The weather was very nice while I was in Bhutan. Temperatures were around 15°C - 20°C (59°F - 70°F) during the day. Once the sun set, it cooled of rapidly to around 5°C (41°F). It didn't rain while I was there. The main tourist seasons are March to May and September to November. In the summer is monsoon season and it rains a lot. Livestock is walking around freely, including goats and cows. I didn't see sheep. There are a lot of dogs around (although not quite as many as in Nepal). The dogs are feral, they don't belong to people. People feed them household scraps. The dogs know which people feed them when and come to get their food at different times from different households. I liked the atmosphere in Bhutan. The people are friendly and sincere. It certainly was worth the visit. I had enough time to see the area around Paro and Thimphu. Bhutan doesn't cater to tourists by setting up all kinds of tourist attraction. You go there to see the culture of Bhutan, not Disneyland. I got to see just what I was hoping for. I enjoyed my stay there very much.